The previous Nokia Lumia 710 deal at Carphone Warehouse is now over, but next up is the Lumia 610. 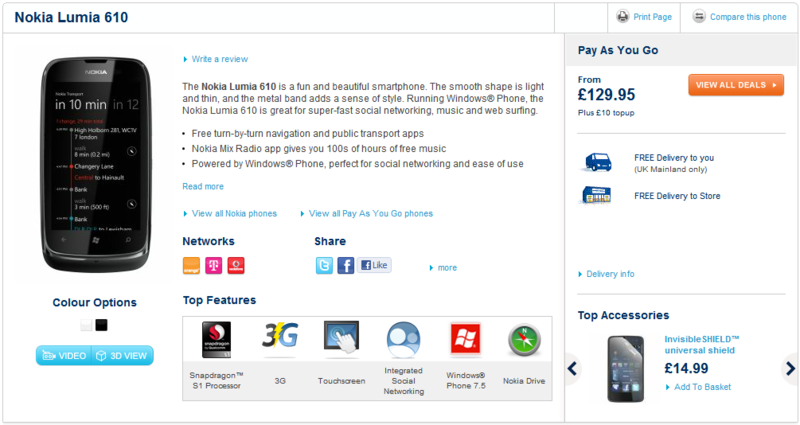 You can now purchase the Lumia 610 Windows Phone through Carphone Warehouse for £129.95 (plus a £10 topup). The regular price of the Lumia 610 through Carphone Warehouse is £180, so you are saving a good amount of money. With your purchase through Carphone Warehouse you are eligible for free store delivery, or free delivery in the UK Mainland only. This Lumia 610 purchase is set for Pay As You Go plans, offered through Orange, T-Mobile, and Vodafone. The only available color option is black. Visit the Carphone Warehouse Lumia 610 product page for more information and to place your order.